GNSS: Global Navigation Satellite Systems. 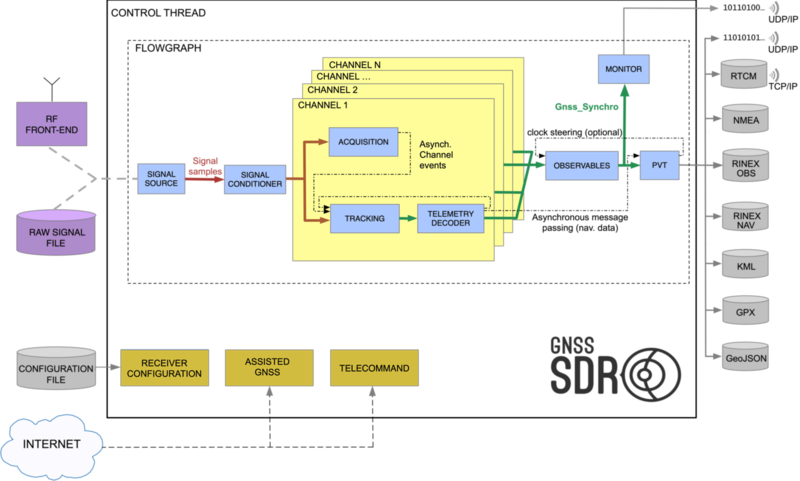 The acronym that encompasses those systems that allow users to compute their position based on signals transmitted by satellites, world-wide. The obvious example is GPS, but this term also includes other systems such as GLONASS, Galileo and BeiDou. SDR: Software Defined Receiver. We play a little trick here, since SDR is usually an acronym that stands for Software Defined Radio. In both cases, it refers to systems in which components that have been typically implemented in hardware (e.g. mixers, filters, demodulators, detectors, etc.) are instead implemented by means of software executing on a personal computer or embedded system. Today’s technology still does not allow processing signals digitally at the frequencies that satellites transmit (about 1.5 GHz, more details in the GNSS Signals tutorial), so we still need a radio frequency front-end that down-convert signals to a lower frequency, making some filtering and amplification in the process, and sampling them at a certain rate, delivering a stream of quantized, digital raw samples to the computing platform (via USB, Ethernet, etc.). Then, GNSS-SDR takes care of all the digital signal processing, performing signal acquisition and tracking of the available satellite signals, decoding the navigation message and computing the observables needed by positioning algorithms, which ultimately compute the navigation solution. The software is designed to facilitate the inclusion of new signal processing techniques, offering an easy way to measure their impact in the overall receiver performance. Testing of all the processes is conducted both by the systematic functional validation of every single software block and by experimental validation of the complete receiver using either real-time signals received by the radio frequency front-end or a file containing those raw signal samples. All the intermediate signals are observable, and the products of the GNSS signal processing (that is, the measurements known in this context as observables and the data transmitted by the satellites in their navigation message) are delivered in standard formats. In particular, you have the freedom to install and use GNSS-SDR right now in your own computer. This is what the Quick-Start Guide is about. Things you need for executing GNSS-SDR. How to quickly build and install GNSS-SDR in your system. How to quickly get a position fix with GNSS-SDR. How to configure GNSS-SDR in a variety of setups.